Looking for a diaper backpack that Daddy can wear? Here’s a look at a few we recommend. As a dad of five kids, I’ll honestly carry around just about any bag my wife tells me to. The flowery patterns that often come associated with the typical diaper bag used to scare me off. Now I’m a lot more worried about who has to change those dirty diapers. Still, if I’m out and about by myself, it is a little awkward to explain to others why I’m rocking the floral pattern of one of my wife’s budget designer diaper bags. Just call me a trendsetter, I guess. Also, pushing the stroller or carrying a kid with a bag around my shoulder is simply awkward. Enter the more gender-neutral diaper backpack. It’s easier on men’s eyes and easier on your back. These backpacks not only are easier to carry around, they simply carry more. With more than one young child to worry about, we need that extra space for snacks, toys, sippy cups and more. The Graco Backpack is smartly designed, has a ton of storage, and comes in at half the price of other similar bags. If you’re looking for a lot of capacity, I highly recommend the Graco Gotham Smart Organizer. 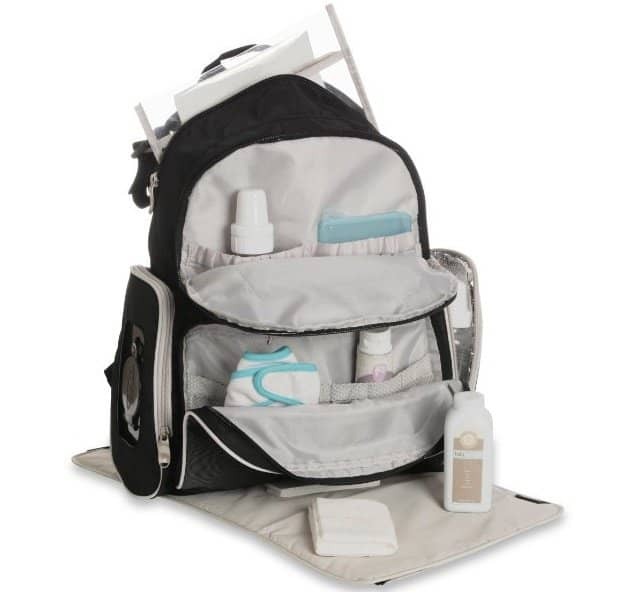 It not only comes with a ton of space, it comes with enough pockets to organize all of your snacks, diapers, wipes, binkies, toys, onesies, LEGOs, or just about anything you can think of! Even many of the pockets seem to have pockets. 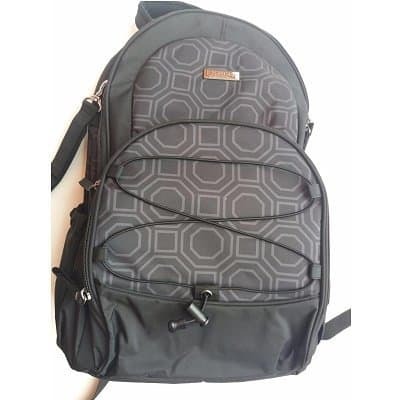 The backpack is very durable and black so it won’t stain easily, and the inside even uses a material that’s easy to wipe down. The straps are also adjustable so that both you and your spouse can wear it comfortably. 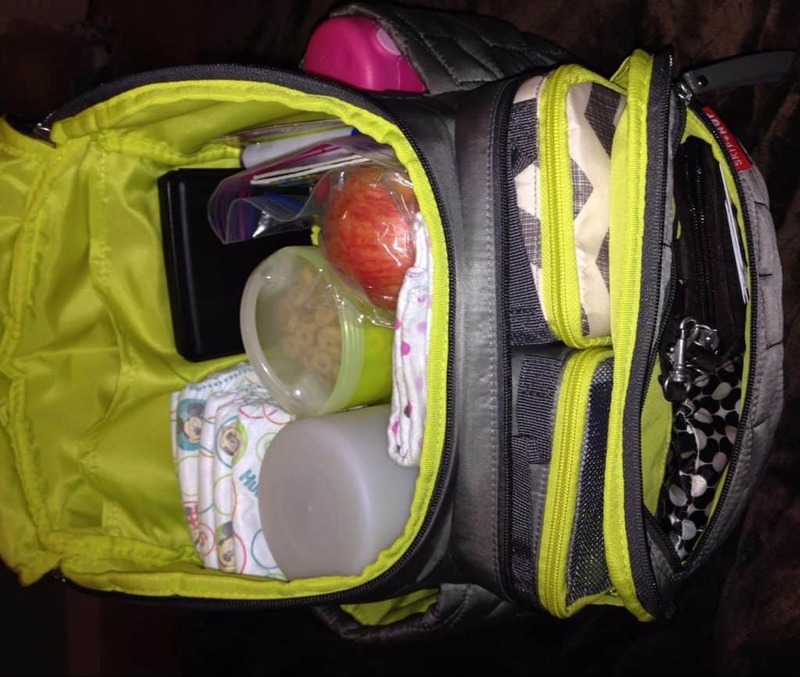 Like many of the bags on this list, it has a side pocket that’s a wipe dispenser. As this is what you’ll likely use the most, it’s nice that it’s so convenient. The only downside to the size of this bag is that it might be more than what you want to take when you’re simply out and about. It’s great for a weekend trip or a long day at the park but is too much for a trip to your favorite restaurant. The Gotham also comes with a wipe container and even a changing pad. Just a heads up, but like most free accessories, these fall a bit short of the mark. It’s likely you have something sitting around that can take its place. Overall, you’ll get the same quality and features with the Graco Gotham Smart Organizer that you get in bags two or three times its price at just under $30. I highly recommend it. If you’re looking for a stroller ready option, try Bag Nation’s diaper backpack. 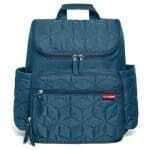 If you’re willing to spend about twice as much as the Graco backpack you’ll run into my current favorite, the Bag Nation Diaper Bag Backpack. 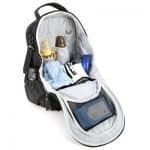 This diaper backpack is high quality and includes all the pockets and organizational tools you’ll need for the day. In addition, the wipe container and changing pad it comes with are pretty decent. Like the Graco model above, this one comes with a convenient wipe pocket. These are perfect for when you’re out and about and need to wash your kid’s hands, change a diaper, or even wipe some boogers (for us this is like every 10 seconds). An often overlooked feature of this backpack is the blue interior that allows you to easily locate the items you need. For emergency situations, like a total tantrum, this couldn’t be more helpful. 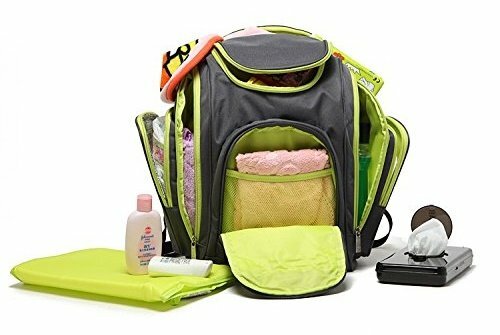 Another huge plus for the Bag Nation Diaper Bag is that it comes with stroller straps that can easily be attached to any stroller or even shopping cart. Overall I don’t have anything bad to say about this bag. The materials are of a good quality and even the strap pads are comfortable. In addition, Bag Nation’s customer service is super easy to work with if you ever have a problem. It’s definitely worth the price. The next one I wanted to include in this list was the Skip Hop Forma Backpack. It comes in turquoise or black. The diamond-shaped pattern isn’t as manly as some of the other options on this list, but certainly, beats a pink floral pattern any day of the week. It’s not as big as the first two bags on this list but does come with many pockets on the inside. On the exterior, you’ll find a couple of bottle pockets, a cube pocket, another pocket with a zipper, and some must-have stroller clips. On the inside, you’ll find a light colored fabric that separates the items you’ve packed from the bag itself. I’d say it’s probably big enough if you’re packing for one child but may fall short if you need everything for two. On the other hand, it is a little more convenient for the day-to-day running around that many moms do. For me at 6’4″, the shoulders straps are a bit short. So, if you have a tall husband, he may have the same issues. 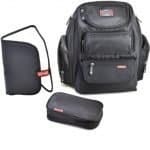 Overall this is a great little bag with a lot of functionality and definitely worth a look if you need this backpack for a single child. Don’t like the color choices? Skip Hop also has their duo backpack in gray. The Kenox Unisex diaper backpack is another budget option at just around $30. It’s good for multiple children and even has a design that doesn’t hurt Daddy’s eyes. For those wanting to pack multiple bottles, this is a good option as it has an insulated pocket that can hold two. One downside to this particular product is that it has a rather strong smell out of the box. So, you may need to let it air out a few days before you use it. 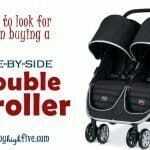 Also, it doesn’t come with stroller clips so be aware of that before you buy. 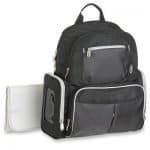 Another good and new diaper backpack you might want to check out is this one from Evecase. It’s lightweight and waterproof. As far as price goes, this one is more of a mid-range option, finding itself more expensive than the Graco and Kenox options but less expensive than the Diaper Nation and Skip Hop ones. Storage includes a huge standard compartment with two different insulated bottle holding pockets. 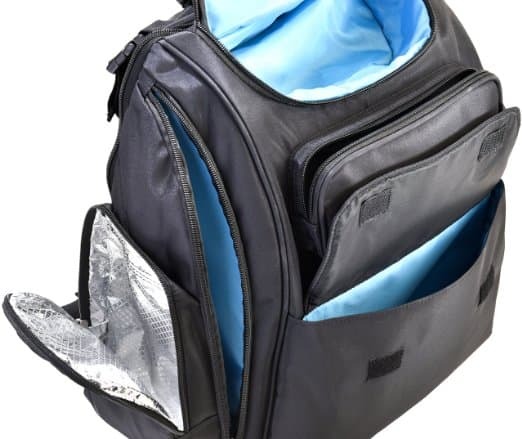 In addition, it has four mesh pockets, a zippered sleeve pocket for loose items, and other side pockets for additional space. For design, it’s black and grey and somewhat plain compared to other options. This is something I personally don’t mind at all. The material is a polyester that’s both durable and waterproof. Overall, it’s a good diaper backpack for the price you pay and should last you a long time. 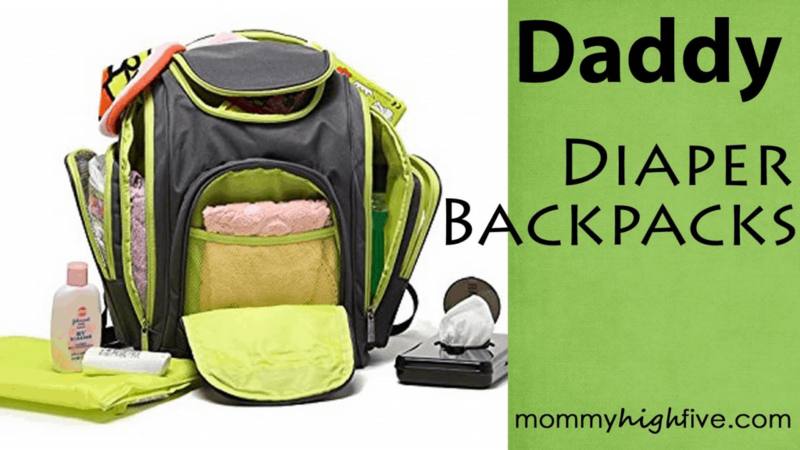 Diaper backpacks don’t have to be expensive. In fact, my favorites are actually no more than $50. That being said, not all diaper backpacks are made the same. So, here’s a look at some of our favorites. I’ve seen a lot of diaper backpacks out there specifically designed for dads with a toolbelt, sports, or even masculine designs. I’ve avoided these designs as I prefer the bags that both my wife and I can use. These tend to be more functional and less gimmicky. Overall if I have to chose one Daddy Diaper Backpack I’m going with the Bag Nation Diaper Bag backpack. It has no real downside and checks the most boxes for me.